What’s a guy to do when my hunting seasons are over and it’s -5°F outside? 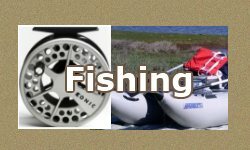 It’s in that short period where the ice is not yet thick enough for ice fishing and when it’s this cold, it’s hard to keep the rod guides free of ice for fly fishing. Since it snowed last night, it might be a good day to stay home and trap Eurasian Collared-Doves. As their name implies, Eurasian Collared-doves (Streptopelia decaocto) are native to Europe and Asia. These invasive, non-native birds were established in the Bahamas in the 1970s when about 50 birds either escaped or were released during a robbery. By the 1980s, they made the jump to Florida. It is unclear how they did it, but they could have made the trip on their own, or they could have blown to shore during a hurricane or there could have been other escapes or releases. Either way, they have been expanding across North America ever since. I found records that indicate collared doves had reached Texas, Colorado & New Mexico in 1995. They expanded into Utah and Montana in 1997 and into Oregon & Wyoming in 1998. They reached Arizona in 2000 and California in 2001, but didn’t expand into Idaho until 2005. How did they jump Idaho and get to Oregon seven years earlier? Perhaps they came through California or there are earlier records for Idaho I didn’t find. I first noticed collared doves in my town in the Inter-mountain West in 2005, but now, they are one of the most common birds in the area. I found range data from several sources (mainly Cornell Lab of Ornithology, eBird.org and many online articles) to create the maps in Figure 2. The figure shows the range of Eurasian Collared-Doves (EUCD) in 2000 and the beginning of 2015. Are Collared Doves Displacing Native Doves? We don’t know yet how much native doves compete with collared doves for food or nesting habitat, but with their population and range expanding so rapidly, we must assume they are competing with the native doves (Mourning Dove, Inca Dove, White-winged Dove and Common Ground Doves) for food and perhaps nesting habitat, because every seed that is eaten by a collared dove is not available for any other dove, bird or animal. If you have not noticed collared doves in the wild, you are probably familiar with a close relative as the magician’s bird, birds released during weddings and in movies or as pets. These are domestic versions of the African Collared-dove (Streptopelia roseogrisea), often called “ring doves”, “turtle doves” or “ringed-turtle doves”. Collared doves are non-native and therefore are not protected by by state or federal law. Let me rephrase that. My state (and probably yours as well) has never relinquished authority over “unprotected” birds like collared doves, pigeons, house sparrows or starlings, but currently in my state, there are no closed seasons, bag limits and no hunting license is required. When I worked for my State’s Division of Wildlife, among other things, I trapped and banded birds, so I am a professional bird trapper and know dozens of ways to passively and actively trap all kinds of birds. I hesitate to give too much information about trapping, because there are always a few people that will accidentally trap, injure and stress protected birds. So, I do not tell people I can’t supervise how to trap birds. But anyone with an IQ close to body temperature should be able to figure out how to catch birds that regularly come to a food source. If you plan on trapping collared doves, just make sure you are trapping the correct doves. It is illegal to trap native doves, any native birds or game birds that includes all quail, grouse and pheasants. I recommend using an active trapping technique instead of a passive method, so no birds are not accidentally trapped. By active method, I mean you must actually do something, like pull a string to catch the birds. It should go without saying that you should be able to identify the correct birds to trap, but I have watched Mourning Dove hunters shoot Killdeer and American Kestrels, so we know there will always be room for improvement and many people will benefit from more education. It should be easier to identify doves before you trap them than when shooting at them, because they should be standing still at close range. Everyone in Southern Canada, the U.S and Mexico need to know how to properly identify collared doves because everyone in these areas have some kind of native doves. Table 1 shows the range and key characters for the most common doves and pigeons found in North America. The table includes Eurasian Collared-Dove, Mourning Dove (Zenaida macroura), White-winged Dove (Zenaida asiatica), Inca Dove (Columbina inca), Common Ground-Dove (Columbina passerina), Band-tailed Pigeon (Patagioenas fasciata) and the Common Rock Pigeon (Columba livia -AKA feral pigeon). Mourning Doves and Rock Doves are the most common and are found almost everywhere from Southern Canada, the U.S. and in Mexico. Common Ground-Doves are found in the Southern U.S. (South-west, South-central & South-east) and in Mexico. Both the White-winged and Inca Doves are found in the South-central and South-west U.S. and Mexico. Band-tailed Pigeons are found from British Columbia down the West Coast into Mexico and the South-west U.S.
Be aware there are two more species that are found only in the extreme southern tip of Texas, Red-billed Pigeon (Patagioenas flavirostris) and White-tipped Dove (Leptotila verreauxi) that are not included in the table (links open photos in new window). Collared Doves are the only doves with a black collar and no marks on the wings. Mourning Doves have a black spot on their cheek and on the upper side of the wings. White-winged Doves have a dark line on their cheek and a white border on the wings. Inca Doves have a scaly pattern over their entire body and show a rufous color in the wing when flying. Common Ground-Doves have a scaly pattern on just their head and have bright rufous color under the wing. Band-tailed Pigeons have a white crescent on a blue-gray neck and a yellow bill and feet. Feral Pigeons can come in many colors, but they have a white cere (fleshy patch at base of upper bill) and a dark bill. We don’t know yet how collared doves will affect native doves and other birds, but with their exponential growth, the rules have changed. I never see Mourning Doves at my feeder anymore, but have as many as 30 collared doves around the yard at any given time. Collared doves are plentiful, easy to catch and delicious and removing collared doves from the wild has to help our native doves. I prefer eating doves that are trapped instead of shot because no bloody spots in the meat or bird shot to pick out or to break my teeth. Plus, most of us can trap in our back yards even if we can’t discharge firearms. 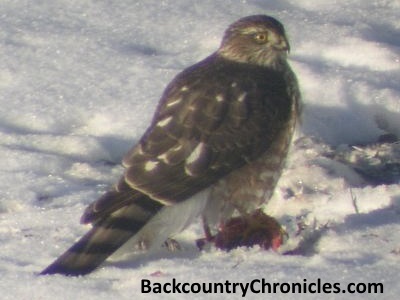 The local raptors appear to have adjusted to the new players in the game and we have watched both Cooper’s Hawks and female Sharp-shinned hawks catch and eat collared doves. The hawks may eat more doves than me, but only because they get to do it full time. I though I had pictures of collared dove breasts before and after I filleted them and after my wife grilled them. But sadly, I do not and the evidence has been eaten. Check back for pictures and for more of our favorite dove recipes. Yes Rob, but people with neighbors have to be very careful shooting any weapon including sling shots, arrows or air guns/pellet rifles. Plus, it is illegal in most (if not all) towns. I prefer to trap the invasive doves in my yard and I don’t get any damaged meat or bite into pellets when I eat them. Not a fan of killing animals for fun, so I guess “awesome videos” are in the eye of the beholder. I was curious as to what you considered to be awesome, so I watched two of your recommended videos. They were either shooting protected animals or were taking irresponsible shots. Not so awesome for me… just a reminder of how many people need to be educated about wildlife, ethics and firearm safety. No wonder people without hunting backgrounds are so afraid of people with guns. Huh, the videos I’ve seen have been for pest control and for food. Both EdGun and AirArms eat everything they shoot or feed it to cats on the farms, and I haven’t seen them take shots that I’d consider irresponsible. The rifles they use are incredibly precise and they’re both highly skilled at calculating the arc of their shots, but it’s in the eye of the beholder I guess. 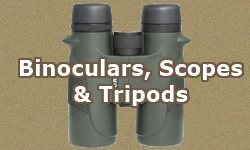 Just wondering, what was the protected species that you saw them shooting? No doubt the shooters are highly skilled and I was amazed as some of the shots they made. But I only took time to look at two videos and I stick with my comments that both showed illegal activity or unethical shots, but I will concede that the illegal activity may not be illegal in all states and the appearance of unethical shots is from the camera’s point of view only. First, let me say my original response was not knowing if you were an impressionable 12 year old wanting to emulate everything seen on the videos or if you were an experienced (mature) air rifle enthusiast. Based on the enthusiasm for the videos in your first comment, I assumed the former. But based on your follow up comment, you are probably much older and wiser. Perhaps the videos are yours? The first potentially illegal activity was shooting in an urban setting (their description, not mine). Check regs, but it is illegal to discharge any firearm (including air rifle) within town limits in most places. It is possible that it is not illegal where the video was taken, but I still would not want to encourage a 12 year old to shoot next to my house. Second potential illegal activity was shooting chipmunks. 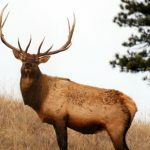 They are protected species in many (but not all) states. It may not have been illegal where they were. Third illegal activity was shooting a pigeons on power lines. It is illegal to shoot at power lines. In addition, the shooter (if caught) will be liable for all damages. Also, many power lines are near roads and it is illegal and unethical to shoot across roads. Forth, crows are protected by the Migratory Bird Treaty Act. States can set hunting seasons and harvest limits, but permits are needed to control crows, so check with your local wildlife officials. Farms can get permits for controlling crows, so perhaps they have permits to shoot them. The videos showed many shots at birds sitting on the roof of a barn or grain silo. Perhaps the building belonged to the people that were doing the shooting, but I can image the farmer would not be pleased to know people were shooting his roof and equipment. I assume skilled shooters know where bullets are falling, but from the camera’s perspective, it was impossible to know if it was safe to shoot over the buildings and power lines or not. But you know what happens when we assume. As a wildlife biologist, I have a general problem with the concept of “pest control”. No doubt we have pests and in many cases they need to be controlled. Since I kill non-native doves, I certainly don’t have a problem with people killing pigeons, starlings and house sparrows. But I do have a problem with shooting chipmunks (legal or otherwise). Shooting them will never solve the problem. The naïve urban homeowners are lucky to only have a chipmunk problem. If they don’t secure the birdseed and pet food, they could just as easily have a rat, skunk, raccoon or bear problem. Do we endlessly shoot them all as pests or do we make sure animals can’t get into the birdseed and pet food in the first place? I think many would allow the problem to continue so they could kill for sport. Personally, I lean more towards the joys of hunting than shooting. Yes, I shoot when I hunt, but I get no thrill from killing and I definitely don’t get a thrill from watching other people kill something purely for fun. I admit I got more of a thrill from the kill as a teenager. Thanks for the comment and for the discussion. These “painintheass” Eurasian doves are infesting everywhere. They are filthy and their numbers are exploding. I rarely hear mourning doves anymore. Two years ago mourning doves were common. At one point, we had a pair or two within a four house radius. They are either gone or have decided to go silent. I hate these invaders. Watha: Native doves are being out-competed for food and nest sites inside town limits by Eurasian collared-doves. I haven’t seen Mourning Doves at our feeder for several years, but I still see a few around, but mostly outside of town. This is an example of why invasive species are ranked high on our list of conservation concerns. I can see nothing in the literature that says whether I need a migratory bird license permit to hunt the Eurasian Collared Dove. Can you clarify this point for me? You are correct Roger. Eurasian Collared Dove are an invasive species and each state may use different terminology, but they are listed as “unprotected” in Texas see here. I live in Southeastern New Mexico and the collared doves are everywhere. There are less of the white winged doves than in years past, but they are still common. Sadly the mourning doves have all but vanished. Because I’m so hungry and I like meat and have cats that like collared dove more than cat food I have taken an interest in harvesting them. With the cats nothing will go to waste. Trapping seems the safer way to go as I do have neighbors somewhat close and other creatures on and around my property. What method do you recommend to kill the birds after trapping them? Mark: I believe the most humane way to kill them is to separate the brain from the rest of the body. They are small enough you can do it quickly with your hands. I also recommend killing them as soon as you take them from the trap, so they aren’t stressed any longer than necessary. They will flop around, so I put them in a bag, then pluck them inside the bag. If you live in a place where they may eat poison bait (intended for pigeons), you may want to keep them in a quiet place with clean water for 24 hours to make sure they are O.K. I’m pretty sure trapping any game bird is illegal in NM. The state Game and Fish dept often will issue a property owner a permit to take protected species that could allow trapping. 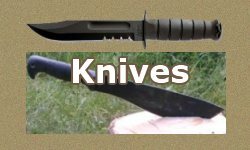 Though there’s an open season year round in NM, there are manner/method of taking rules and of course license requirements that apply. Also the ‘waste of game’ law applies and requires that game birds be used for human consumption. 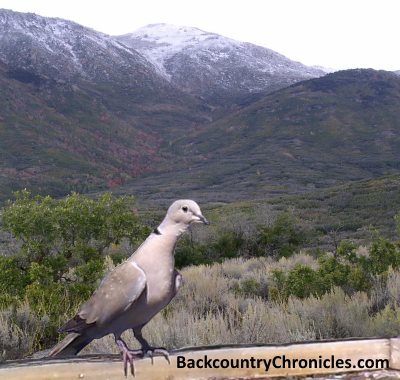 Chris: You are correct that New Mexico treats European collared-doves as an upland game species and trapping would be illegal, but the legal hunting season is only open April 1 – March 31, not year round. There is no limit on collared-doves. I don’t think they would be competing with native doves for nest sites. Competition for nest sites is mainly an issue for cavity nesters. Doves and pigeons are platform nesters and reasonably flat surfaces that can be used for nesting are not in short supply, unlike suitable cavities. Gayle I agree that invasive doves probably don’t compete for actual nest sites, but was thinking more in terms of nesting territories and food competition. This year, we had native Mourning Doves nest in one of our trees, but previously collared-doves nested in the same tree for three years. I have no doubt that two dove species could even nest in the same tree at the same time, but that is not how it usually works. Why this year and not before? Weather? Loss of collared-dove pair? A good question to answer would be: How close together can they nest successfully? I have seen mourning dove nests on the ground in sage brush habitats, but have not seen documentation that collared-doves can do the same. But there is no question that collared-doves are taking over urban and farmland habitats. Since you can observe these species in the wild, are you able to observe their behavior and interaction? Are the collared doves ever aggressive toward the mourning doves? if you put out food, do you ever observe them feeding together? 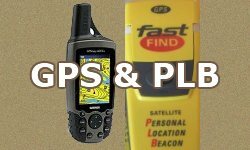 It would be valuable information to gather. Yes, both species are easy to observe, but we’ve seen few interactions between them. Before the Eurasian Collared-doves (EUCD) arrived (about 2006), we had a few Mourning Doves (MODO) at the bird feeder and they started to nest in the trees around the house after the trees were large enough. After the collared-doves arrived, we see few MODOs around the neighborhoods, but do see them in sagebrush areas as well as pastureland and cropland surrounding the town. The collared-doves have taken over the areas with planted trees and the native doves are primarily in the open areas. Do most still nest in trees? (I mentioned before, MODOs will nest on the ground in open areas). I have never seen them feeding together. Collared-doves are more aggressive around the feeder, so I am sure they would push any MODOs out. EUCDs seem to ignore the smaller birds, but are intimidated by the scrub jays. A few anecdotal observations are just that. At some point, some poor Master’s or PhD student will design a rigorous study and answer the question. The Cooper’s Hawks and female Sharp-shinned Hawks seem to enjoy the collared-doves. 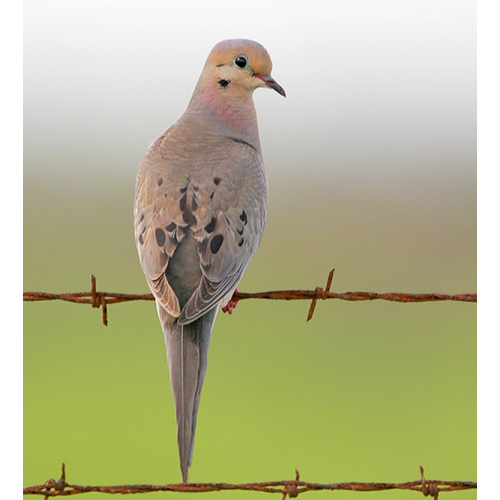 I am a farmer in the Southern tip of Texas, and I have witnessed white winged doves and collared-doves feeding in milo fields side by side and also in flight groups together. Bill B. Do you shoot or trap? I’m in northern Colorado live outside city limits and have had an explosion of these doves over last 2 years; time to clear them out. Maybe yours came down to me ha ha! 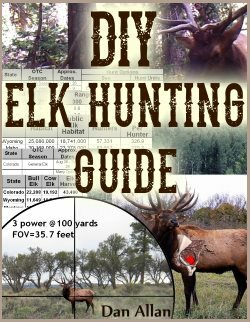 Anyone have good resources book/video for trapping. Thanks!! As a former wildlife professional, I am not in the business of teaching the general public how to trap things, but think about it. I could think of a thousand ways to trap doves that are coming to a food supply. 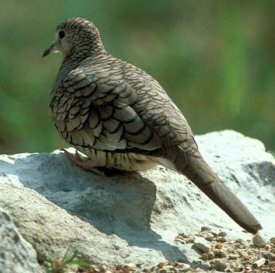 Keep it legal and enjoy this new invasive dining resource (best doves ever, because no bird shot).